You can use your Credit Union ATM Card to get cash from your share (savings) account at thousands of Accel\Exchange®, Star®, and Alliance One® locations throughout the United States. If you have a Savings account getting a card is easy, simply complete an application. 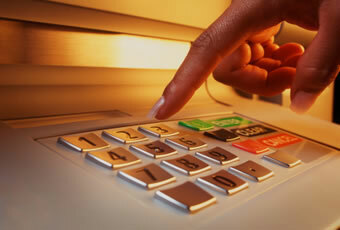 It’s an ATM Card you can use to get cash from your Savings or Checking Account only better! Use the card instead of a check or credit card: Wherever you see the MasterCard® symbol, simply present your card and the amount of your purchase will be automatically deducted from your STJ FCU checking account. If you have a share draft account getting a card is easy, simply complete an application. Members are permitted 5 generous pin transactions per month without a fee. Unlimited Signature based transactions, just choose Credit when processing your Debit transaction. STJ Federal Credit Union operates a 24-hour ATM at its main office located at 1811 Whipple Ave NW in Canton and our branch at 315 Sherban Court in Louisville, which offer quick cash withdrawals, allows for transfers, accepts deposits and issues cash advances. Any ATM having the Alliance One logo is surcharge-free to members. Click the Alliance One logo to check out other locations nation-wide in the Alliance One surcharge-free network. STJ FCU is a member of the CO-OP ATM Network. The back of your ATM card carries the CO-OP Network logo identifying STJ FCU as a member of the largest credit union-only ATM network in the country. CO-OP Network membership provides surcharge-free access at 30,000 ATMs, which includes 9,000 deposit-taking and 5,500 7-Eleven locations throughout the U.S. and Canada and 500 Walgreen's locations throughout California. CO-OP Network's membership has access to over 800,000 ATMs worldwide through links to NYCE, STAR, Cirrus, Pulse and Plus. New - Text Messaging and GPS! Find a CO-OP Network surcharge-free ATM when you're away from your computer! Before you take your next road trip, be sure that you know exactly where to get your cash for free. Text your location – address, intersection or zip code – to 692667 (MYCOOP) from any mobile phone or download the database of more than 30,000 surcharge-free ATMs directly to your Garmin, Tom Tom or other GPS device. * You'll never be lost looking for a surcharge-free ATM again. Like CO-OP Network ATMs, 692667 (MYCOOP) is a surcharge-free service. But check with your mobile phone provider as standard text messaging rates apply. And don't worry, you won't receive any unsolicited messages by using 692667 (MYCOOP). If you're traveling out of your usual area and plan to use either your STJ visa or Debit card, please let us know. To prevent fraud, Visa and Mastercard analyze usage patterns on all card transactions. if you are not in your "usual" area or at your "usual" merchants, or if VISA/MC is concerned about suspicious or unusual activity, your card and account could be blocked. Also, please remember to update us if your address or phone number changes. If we need to reach you it is very important it to have access to your current information.